The past few days have been corkscrew filled, with the collectorcorkscrews.com auction having lots of corkscrews changing hands, and quite a few bidding wars between the usual (and sometimes not so usual) suspects. Ladies legs with unusual stripes garnered much attention. But, there were lots of bidding wars, large and small, for various pieces. On many, Ion often won out, but a few others got to bellow a triumphant yelp of antique corkscrew glee, as each auction lot ended. I missed out on a couple of lots, but not for a lack of trying. The one I wanted most was the Hull MFG. compass piece that is headed to Romania. This is the second example that I have seen. The other is in the Morris’ collection. The only thing I did manage to pick up was a 1895 Brown patent frame. It is in lovely condition, and will fit well into the collection. That said, while many were focused on the collectorcorkscrews auction winding down, another auction was ending on a non-ebay auction site, and I managed to pick up a carved alligator for a song–not that I actually sang. In between the Saturday auction listings and the Sunday auction listings, the lovely personal personal trainer and I ran the Portland 10 miler–as one would guess–in Portland, Maine. And, this afternoon headed off to attend to industry wine and beer tastings; a nice follow-up to a sunny 10 miler. And, in between all of that, I decided to hop on eBay for a moment, and an interesting lot turned up. Actually, it was a pretty lousy lot, with 30 corkscrews and openers, but a couple of the thirty are worth the price of admission. When the lot arrives in the coming days, I will report back with markings and such. A corkscrew filled weekend, followed by a bit of wine. A good few days. Be sure to check out the collectorcorkscrews.com auction! Lots are ending today, starting at 1:00 pm est. time. You can see the lots here! As mentioned the other day, there are two known versions of the Rees patent. The long handled one, that will soon be arriving on the island, and the Rees Vest Fulcrum Corkscrew. I don’t have this piece, but if anyone does have a Rees Vest Fulcrum Corkscrew, I would happily make an offer–trade or buy. 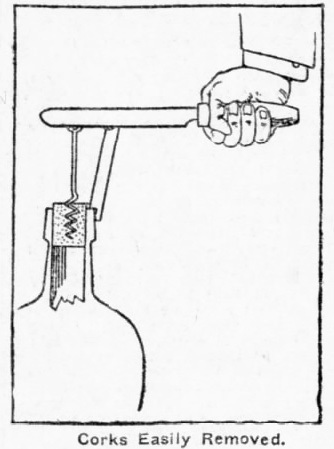 In 1907, Rees was definitely making an effort to get his corkscrew to market. In 2015, I blogged about a Rees patent corkscrew, having found an 1908 article that pictured the piece. Clearly this is the Rees patent. And, despite its ability to remove, “the most obstinate cork…,” the Rees, and there are two versions of it, simply doesn’t turn up. Tommy lucked out in a road trip several years ago, and found a Rees for the smoking price of 8 dollars–this one making his best 6 for that year. And, of course, there was one that turned up on the collectorcorkscrews.com auction. Again, given the scarcity, it brought a substantial number–quite a bit more than Tommy’s steal. Okay, so where are you going with this Josef? Well, a couple of days ago, several auction lots appeared on a non-eBay auction site. And, there were multiple lots that contained corkscrews. There were nice things in each, but largely common stuff. In one lot, there was a power cone. And, I kept an eye on that one. After seeing that lot, I continued to peruse the other listings in the auction. And, then something caught my eye. At the base of the box… Is that? I did place a couple of bids on the Power Cone lot. Given I was outbid immediately, I figured someone wanted it more than I, and I should just let it go. Still, I decided to hold off bidding on the Rees lot until the closing minutes, hoping that it would slip through. On the online bidding, it did. I was the high bidder, but all of the auction lots were next to be taken to a live auction; one that was not being broadcast online. No jumping into the fray, I just had to hope for the best, and also hope that Barry wasn’t nearby, as the auction house was only a couple hours away from him in Florida. The auction ended Saturday, but no email came through to confirm that I was the winner. So, I sent the auctioneer an email, and received a response later that afternoon. Ever hopeful, as of 11:45 I still hadn’t received a confirmation. And, I was pretty sure this one got away. Until, I got a message from the lovely saying that there ware a voicemail from an auctioneer. I checked voicemail. Yes! I did win the lot with the Rees!!! This surely will make the best 6 of the year. Better pictures of the Rees after it arrives and is cleaned up a bit. It is that time of year again, and the latest collectorcorkscrews.com auction is open for bidding. What corkscrews will change hands? What bidding wars will erupt? There are lots of fantastic corkscrews upon which to bid! You can link to the auction here! But, when it comes to bar screws, please stop. Remember what Uncle Ben said to Peter Parker (Spiderman). Fix the corkscrews, if they need repair. Do not…install a light socket. As you all know, I am a little obsessed with Murphy corkscrews. And, a couple of years ago, while visiting with friends in Connecticut, one of their friends, mentioned that yet another friend had recently purchased the R. Murphy Knife Company. Well, relatively recently, they bought it about 10 years ago. Last year, a small group of us got together for dinner, and as it was the same group (pretty much) from ur previous get together, the subject of Murphy was discussed once again, and emails were exchanged. The following day, I sent of an email to the new owners introducing myself, and mentioning the Bob Nugent article on Murphy. They responded enthusiastically, and explained that they too had a copy of Nugent’s article, and were welcome to a visit, to allow us to look at the catalogs in their collection, and to see the corkscrews that remained at the factory. Wait… what? There are Murphy corkscrews that still remain at the Murphy factory? This email exchange took place in the late Summer of last year, and knowing that they would be going into their busy holiday season, we revisited the conversation after Christmas, we settled in a time to visit recently. The owners also asked if I could bring some of the Murphys from our collection, so a box was loaded up, and we headed off the island. The R. Murphy Knife Company is located in Ayer, Massachusetts, and it would take few hours to get there, so the lovely personal personal trainer and I headed out with coffee in hand. A few hours later, we arrived! Gathering the aforementioned box of Murphy corkscrews, we headed in and were greeted by Mimi and Mark, the new(ish) owners of Murphy. We exchanged pleasantries, and thanked them for the invitation. In short order, the conversation turned to corkscrews, and they showed us the catalogs that were in their possession, followed by 5 corkscrews. Two of which were the Murphy patent disc with the upturned hook. And, they were in fabulous shape, given they never left the factory. As, we paged through the catalogs, and discussed some of the products they make today, we again returned to corkscrews, as they wanted to see what I had brought. And, intermittently, various employees would enter into the office from the shop, and take a look at pile of corkscrews laying on the conference table. Interestingly, it was the stag handled bell that seemed to be the corkscrew to which most of the folk were drawn. While the conversation continued, I returned to the catalogs and took photos of each page that featured the corkscrews. These will be added to the Murphy website at a future date. After the corkscrew extravaganza, we were invited to tour the Murphy factory where they make a myriad of different knives. The entire process from beginning to finished product was fascinating, and the fact that they still use some machines that date to the 1930’s is remarkable. One particular tool cabinet, I thought was remarkably cool, as it was relocated from Mansfield, MA to Ayer when the company moved here. So, this quite literally was Robert Murphy’s tool box. Following the tour, we headed back to the office, and chatted a bit more about the company, and all of the fantastic knives and tools that they are making. Mimi requested some Murphy corkscrews for their collection, when I run across others, and I promised that I would work on putting together a small collection for them. Thanks for the hospitality Mimi and Mark! Happy Easter! and, Happy April Fool’s Day! Sue and I have been doing a bit of traveling the last week or so, and the bloggy blog will soon be filled with tales of our adventures. And of course today is both Easter and April Fools Day… so happy both. More in the next day or so….